Have a Hong Kong company setup but still confused about what exactly the ongoing fees that are required to keep it going? Today’s guide is for you! We are digging into the nitty gritty of what you need to do to keep your Hong Kong Limited company in good standing. If you do not yet have a Hong Kong company and want to learn more about the costs of setting up and the overall process, please check out extensive Hong Kong setup guide free guide. Thank you for your work, it’s definitely useful for anybody interested in this topic. But I have to admit that after a long research of informations about opening a company in Hong Kong I think that.. IT’S REALLY expensive! A lot of startuppers are considering and choosing Hong Kong to do their first steps but I think that if you are on a tight budget as I am there MUST BE some alternatives that are much better. Every consultant tells you that opening a company in HK cost around 10.000 HKD, they forget to tell you that the accounting will be 10.000 hkd more and that the Auditing is 10.000 more.. Oh yes, they advise you to have 10.000 shares of capital, 1 hkd each.. Again 10.000 hkd. You have to know it by yourself or they will just send you an email to inform you that it’s time to pay a lot for something that you didn’t expect. Even bridges.hk is doing the same. In total you have to spend around 45.000 HKD the first year, when I opened my first company in Italy I spent 3.000 hkd… Much better for a startupper with a tight budget. I suppose there are other countries with these opportunities around the world. What’s your opinion? Do you think there is a cheaper way to own an Hong Kong company? Now I am looking for a cheap solution to have a company abroad with a gateway for my e-commerce. I’m interested in incorporating in HK for a few reasons but simply put, it would be financially viable if it cost less than $40,000 HKD/year to do. I picked up your guide but was wondering if I need to use an agent on the ground to setup? And then on top of it, I met Nikos from CoinSimple while he was visiting Hong Kong, and he was frustrated with his current agency for constantly adding costs and fees without prior agreements and notices. That is pretty embarrassing for Hong Kong service providers, and for those of you who might one day read this article–Westerners don’t like hidden fees. If you do business with the West, be clear up front about your charges. I have also talked to Gerard from BetaFresh and he was quoted 10,000 euros to open a Hong Kong company (about 100,000 HKD), but luckily he is a podcast listener! So the costs not just to set up a Hong Kong company, but for the ongoing upkeep and maintenance definitely deserves a blog post. I have consulted with many auditors and accountants on this topic, enough now that we have set up our own agency and you can see our list of services here. I will take parts of our business processes in upkeeping and transferring over Hong Kong companies and also add my own insights and opinions. Does It Need to Be a Domestic Hong Kong Company? According to Malakia’s case, if his e-commerce business is not operating in Hong Kong, and has no profit arising in Hong Kong, then yes, he has other jurisdiction options that could be cheaper. Option 1 is he can still open a Hong Kong company. As his company does not involve a business in Hong Kong, he can file an “Offshore Claim” to the Inland Revenue Department (IRD) and wait for the IRD’s approval for tax exemption of not paying the 16.5% corporate tax (approval of tax-exempt status is subject to the IRD’s assessment). Even if he has received an approval of ‘Offshore Claim’ from the IRD, his company still needs to prepare accounting records and yearly audits, but he shall not receive the Profits Tax Return from the IRD for several years and so does not need to file the Profits Tax Return during the period. The IRD will review the company’s tax-exempt status once every few years. Option 2 is he can open an offshore company like Seychelles or BVI, the fees would be setup fees (around HK$10,000) + annual maintenance fees, without tax filing and auditing requirements. So this means you don’t have to worry about a yearly audit by a Hong Kong CPA, or bookkeeping. But I do have to say that having an offshore island company there may be more issues getting a bank account or merchant account. Their business involves operations in Hong Kong, such as a shop, physical office, and full-time staff. They want to treat Hong Kong as a stepping stone into China or the Asian market. It may be for import and export in Asia, as many factories are set up in Hong Kong. If the entrepreneur’s business operation is in Hong Kong, he has no choice but set up a Hong Kong company (as all business operation in Hong Kong is taxable at Hong Kong’s 16.5% profits tax). There is one concept Malakia got wrong. He can actually put 1 HKD as the share capital of his company. The agent will normally advise the client that 10,000 HKD in share capital is to give the company a better reputation. People can search a company’s value via a public search on the Hong Kong Cyber Search Centre. I will be quite honest, I do searches more and more now on Hong Kong companies before I do business with them; it’s free and it gives me a better understanding of how long they have been in business and their company name history. For a small fee, I can dig more into owners and other tidbits. A second point is that he can use the 10,000 HKD in share capital for the business’s operation costs, such as paying 5,000 HKD for audit fees, paying office rent, etc. There is no need to invest 45,000 HKD in total startup fees for the first year. I am curious which agencies Malakia is talking to. There are so many either misinformed agents out there or ones that are out there to take advantage of business owners who don’t have any idea how to do business in Asia. I hope this article and the podcasts are helping a bit with that; there is still a long way to go. Why Set up a Hong Kong Company? The reasons Hong Kong is the jurisdiction of choice for some people is due to its good reputation in the market. Yes, you can pick some other jurisdictions that are cheaper, such as the “offshore islands,” without the need to prepare accounting and auditing reports, but then the regulations of such systems are very loose and your potential suppliers, bankers, and clients might find it risky to do business with you. But for a Hong Kong company, because of its well-developed financial infrastructure, regulatory structure, reliable online banking system, free (but still safe) transfer of money, low tax rate and sound legal system, many people still prefer to pick this jurisdiction as a good foundation of their firms and businesses. Although it requires people to complete accounting and auditing reporting, it’s worth avoiding the risk of opening a business in a jurisdiction that doesn’t require such documentation. While our Global From Asia agency service is not the cheapest in town, but we know what we’re doing and are professional (e.g. know bank managers from HSBC, Hang Seng or others and a PayPal representative into the mix to meet clients so you won’t be running around the city, etc.). When it comes to establishing your company and relying on solid advice and knowledge, it makes sense to get a dependable provider to give you peace of mind that your company is in good hands. Here is the introductory email for the new entrepreneur client, we do not hide anything from our clients; we mention in the first email that the company maintenance needs a registered office address, company secretary, accounting, and auditing arrangement. We do not have any hidden costs, all government fees are already included in our package. We have outlined our services with pricing on GlobalFromAsia.com/products and you can browse through each service you want one by one, with pricing on each. If you have a Hong Kong company and want to transfer over to us, we have clear HK transfer pricing and process here. Thank you very much for your kind interest in our Hong Kong Company HKVIP Incorporation service. I’m really excited to get you started on the Hong Kong Company Setup VIP package. Here is the invoice to get started (if Paypal or Credit Card is Ok, else I can send bank transfer details). Once I get this information listed below back and payment, it will take approximately 2 weeks to process the company. Please note this is also based on prompt replies on your side as questions do come up that need your input. Pen Name / Alias – do you have a pen name you use in daily life? Should we be aware of this when we meet? Correspondence address – we do not plan to send mail here, and this will not be where the Hong Kong company address will be registered to (we’ll use our Hong Kong office for that) but this is for incorporation documents. Contact information – again for our own internal records, your email and phone number you would like us to have for company correspondence. Directors – will there be any other directors? Shareholders – will there be other shareholders? Issued Share Amount – How many shares do you want to issue? The default / most common / recommended under 95% of circumstances is 10,000 shares at 1 HKD each share. This is not a fee that needs to be paid now. If you want to discuss this on a call let me know. Company Name requests / requirements. Once we move to the next steps, I will provide you with the information needed, this is all I need to get started for now to register the Hong Kong company. Actually the entrepreneur can do the accounting part on his/her own if he/she wants to save money, especially for those who do not handle many transactions at the beginning. Update November, 2014: The policies of HKICPA (Hong Kong Institute of Certified Public Accountants) does not like accountants and CPAs to show pricing, but we feel entrepreneurs need to have a price idea before setting up the company and do not agree with this policy! Again, costs of bookkeeping is a cost of doing business, anywhere in the world. Sure, there are offshore islands that don’t care – but are those legit? Any good business owner will make sure they keep their books in order. The yearly audit is something you are not able to do by yourself as the business owner. By having a Hong Kong domestic company you must have a Hong Kong government-approved and accredited CPA (certified public accountant) to check over your books and accept them. Only the auditing part requires a CPA, and fees start from only $5,000 HKD. We have our pricing for audits laid out here. Some people have been contacting us and asking what is a SME version of an audit. Actually, that is the majority of audits we do. It is for those doing lower revenue and therefore have less requirements in the audit process. You can say that the quotations you receive from us (as well as most CPAs) will be for the SME version of an audit. While you don’t need to be in Hong Kong to have a HK company, you need an address for the government to send mail. Most agencies have a service for this, and you can also use the address for your other mail and invoices and website. Global From Asia has various pricing options you can read about here. This is one of the bigger differences with Hong Kong and Singapore. In Singapore, you need a local company director. In Hong Kong, just a company secretary. This is not a shareholder or owner, but instead someone who can talk to the HK IRD (tax department) on your behalf. Here at Global From Asia we can help you with company secretary service, as we’re an accredited registered agency. There are 2 yearly fees for a Hong Kong company. A lot of times, agencies will merge this with their service fees. It is best to be clear with the company before signing on and paying. For Global From Asia, we include the NAR1 fee in the Company secretary charge. For the BRC, we let you file that directly or take care of it when you’re filing the company secretary package. Many people get stressed out when their company agency sends them a scanned HK government form. Here’s the quick list from the various forms. * Profit Tax Return – The IRD is now asking you to prepare your books, complete your audit, and pay your taxes. You have 60 days from when its issued to finish this. * Salaries Tax – Do you have staff? Paying pension? If yes, declare it here. * Other surveys, correspondence – Keep on top of them! I hope this gives you a bit more confidence on doing business in Hong Kong! So many people forward me emails from various agencies and are confused at the standard copy/paste templates they get. And it looks scary, warning them of late fees and penalties if they are late or do something incorrect. 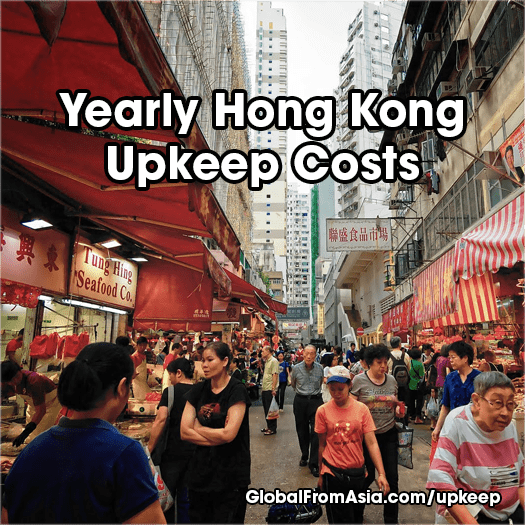 Basically the ongoing annual costs of a Hong Kong company should be about HK$15,000 or more, depending on how much volume your business is doing. And if your company is doing higher volumes, paying a bit more shouldn’t break the bank. Domestic Hong Kong company. If you have staff or clients in Hong Kong, you will need to pay 16.5% tax and complete accounting and file audits yearly. Hong Kong company that will file an ‘Offshore Claim’. If you have no staff in Hong Kong and your company does not involve a business here (i.e. there is no profit arising in Hong Kong), you can file an Offshore Claim to the IRD for a chance of not paying the 16.5% tax. You still need to do the yearly accounting and audits even if you have obtained an approved Offshore Claim, but will not receive the Profits Tax Return for several years and so no need to file during the period. Offshore Seychelles, BVI or other “island” company. I do not have experience with this, but many can help you. Some agencies can help too, and you can still open a Hong Kong bank account, fees for banking seem to be higher. But if companies research you, you may be seen as a higher risk. Plus banking is getting harder, and no way to get a merchant account there. Any comments or feedback helps a lot, and can be used to create more blog posts and podcasts in the future. Cheers! Enjoy our blog, podcast and want to support? Thinking to setup a Hong Kong company or have one and want to transfer your upkeep to us? We welcome new clients, let’s do it! This is the ultimate way to support our continued expansion of transparency in the market! Get the VIP treatment on your Hong Kong company setup. From A - Z, we work with you on finding the name to setup to bank account and getting plugged in - our HKVIP service is where it's at! Our full service concierge team will work with you and ensure you do things like a pro! Already have a Hong Kong company but tired of miscommunication with your current company secretary? Join our HKVIP clients and let us smooth out your ongoing company upkeep forms and processes. Learn more on how to transfer your current Hong Kong company over to our services. We can help you from the virtual office address to company secretary, audit coordination, and all other government forms! another great post, bookmarked. Love the fees tables. Thanks a lot! Michael, you are dropping mad knowledge here. and thanks in advance for the commission, u the man! Hi Michal, Quick question on the loan agreement, do ypu have any particular format of agreement to suggest? What are the fiscal implications of the loan? How long can it last? Is it key the agreement is based not in HK as a location if the lender is not resident or working in HK? Look forward to hearing back from you. Thank you very much for your exremely useful blog. Yep, this is great, thanks Michael… You’ll be receiving an affiliate commission from Bridges shortly from me too! Thanks for the comment – a ATM withdraw would still need to be accounted for. Is it a cash expense for taxis and restaurants? Or is it a dividend? Or an employment / salary payment? Just how you categorize this ATM withdraw. I am working on a lower package for 100 transactions a year – i’ll send you an email. Hi Michael. Just checking , how much is the general charges for Auditor to attend to claiming to offshore profit tax? Is this a one time or a year affair that we need to attend to ? And lasting , if the year is not making a profit , do we still need to attend to the claiming of offshore profit tax ? Thank you in advance the enlightenment. I know this is an annoying answer, but “it depends” – the cost really depends on the amount of complexity of the business model, the amount of transactions, the amounts of countries, the riskiness of it being approved. Maybe between $3,000 to $7,000 USD.. and up depending on the volume and complexity.